Israeli soldiers abducted, overnight until dawn hours Tuesday, seven Palestinians, including five children and one woman, from their homes, in several parts of occupied East Jerusalem. The Palestinian Prisoners’ Society (PPS) said the soldiers abducted a young man, identified as Ahmad Zahran, from northwest Jerusalem. It added that the soldiers also invaded Kafr Aqab neighborhood, north of Jerusalem, stormed and searched homes, and abducted a woman and two of her children, before moving them to an interrogation facility. 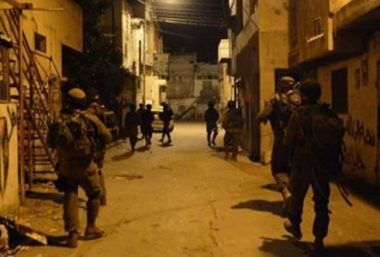 Furthermore, the Wadi Hilweh Information Center in Silwan (Silwanic) said the soldiers also invaded homes in the town, and abducted Khaled Fawwaz Abu Qalbein, 14, Mohammad Hani al-Haimouni, 12, and Abdullah al-‘Abbassi, 13.